Having a bad back or back pains is bad enough when your in the comfort of your own home. But whats even worse for your back, is to be stuck in a poorly made office chair for 8 hours a day. Using the incorrect supportive chair everyday may drastically affect an existing bad back and possibly create painful lower to mid region back pain. Even if you’ve never experienced intense pain in the back region before, we think it’s crucial that your office chair is very supportive for your prized possession. Your back!. So what we have reviewed on this page are some of what we found to be the the best office chairs for back pain and bad backs in 2017. It’s an important topic and one that should be considered when you work 40 hours a week or even more behind the computer desk. First lets have a brief look at some common principals to consider when trying to alleviate back pain in the office. Having the best ergonomic office chair in the world for sore backs means absolutely nothing if certain procedures aren’t put in place. Ones you must ensure you practice to prevent and maintain shoulder, neck and back pain. 6 Is There A Perfect Chair For A Very Bad Back? First and foremost, your body takes top priority. If your experiencing unbearable lower back pain or any discomfort from being tied down in the office. Take action, go see a Doctor. It doesn’t matter who your Boss is, or what deadlines must be met. You must take care of your body. After all if further damage is implemented and you can’t work for the next 3 days from persevering with extreme pain. What good is meeting those deadlines now, or keeping the Boss man happy?. Stay active in the office. 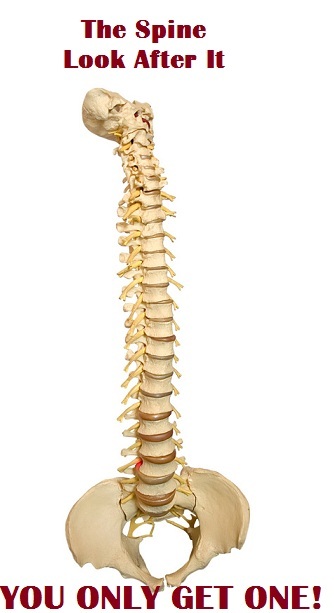 Try not to keep your spine in the same position for extended periods. This may cause damage. Even if the chair is so ergonomically sound you enjoy sitting in it for hours. Make sure you get up and walk around for 5 minutes every hour or so. Stretching is an important part to taking care of bad backs when in an office chair. It helps keep all the important parts loose and relaxed, which then improves your working conditions. A good source for office stretching can be found at Spine-Health. Ensure your office space is ergonomic. This will enhance the comfortable office chair your now the proud owner of. Bad backs can be a thing of the past with the correct safe office procedures. Make sure the office chair is fully adjustable so you can Aline the whole seating process to your body, including the lumbar support. Additional back support can also be added to most office chairs. This is something to also consider when on a tight budget. These chairs below are all great in one way or another, however what we will be presenting to you are the reviews about spinal/back enhancement aspects of the chair. This is one of those rare moments when you think you find something so great, but wonder wonder was is it not overpriced?. Well I can’t answer that for you, but I can say that this chair is amazing. Not only in price, but for complete all roundness. Normally from a chair of this caliber I would expect to pay hundreds more. But I was surprised to find out out it’s rather affordable. It’s fully adjustable and I mean fully. Even the arm rest can be height adjusted. Which is just great for the shorter office workers. Plus it allows you to make the chair suit your body and shape. I found the back support does wonders and the knob for the lumbar support works amazingly. It may sound hard to believe, but this chair boasts an impressive 8 adjustable features to potentially give you the ultimate in back relief and comfort. However with this kind of functionality, you may end up paying a lot more. But in the end, if it saves me discomfort and hours of endless pain behind the desk. Then I think money is not a major influence, especially when it comes to looking after my back. The ErgoHuman has a good warranty as well, which I find to be a pretty nice addition. The mesh material is a brilliant method of allowing air to circulate around your body, which looks to be made from a very strong material. So durability may not be be an issue here, neither should unwanted sweat. Some people have said this chair is heaven to sit in. I don’t know about Heaven, but the ErgoHuman sure does add a fair amount of comfort to it’s plate. 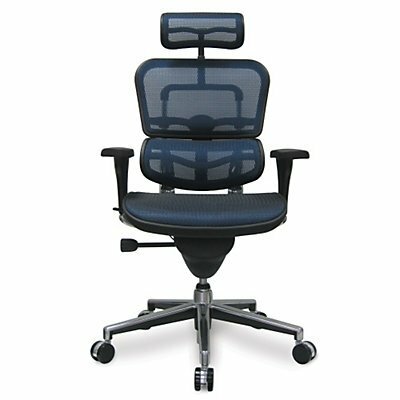 Which combined with the mesh air flow technology and numerous amounts of custom controls, I believe this office chair to be the best of the best when it comes to looking after that bad back. What I also found cool was the amount of available colors to choose from. Is There A Perfect Chair For A Very Bad Back? This office chair by Boss has been around for some time now. I can tell by the amount of padding that this chair is going to be great. So I consulted a co-worker whom uses this chair daily to give me some feedback in regards to solving office chair related back pain. While he said many of great things about this chair, the thing that I took from what he said was that as a suffer of chronic bad aches and pains, the Boss had been a welcome relief. This chair by Boss is a stand out office chair for the staff here at office chairs for heavy people. 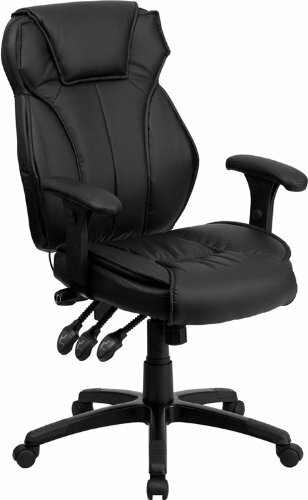 Simply based on outstanding performance, the Boss was rated our top office chair that can hold up to 250 Lbs. Which is also a popular chair that I’ve noticed going from office to office over the years. Particularly in the Executive’s and Managers offices. So the Boss is held in high regard around here. The Boss is well padded as you can see in the image and feels rather comfortable. The seat has a waterfall edge, which is great for reducing leg fatigue and lowers enough to cater to the shorter people. A 5 foot Lady in our office swears by this chair.